What did I see when I poked my head out of the hotel window in Le Mont-Dore? Sun? A few clouds? Any improvement in the weather however minimal? No, it was the same old drizzle, low clouds and miserable cold. We'd had enough. After a terrible night on a hard bed that shook every time someone turned over, which was often seeing as it was so uncomfortable, we decided to go home by the quickest route possible. I was so keen to leave I suggested we wait for coffee until reaching Saint-Nectaire a few kilometres up the road. After paying an over-priced €70 for the room, we walked in 5°C drizzle to the car, parked in its free space behind the casino (the only place whole town where parking is now free), and I took the wheel to make sure we were actually leaving, now! The route out climbs onto a plateau which was so foggy, there wasn't 20m visibility ahead. It stayed like that until we came down off the plateau. How glad were we to be leaving? Saint-Nectaire has two parts - upper and lower. The upper old town has a church, a bar (closed) and houses, and that's it from what we saw of our short tour. All the shops are at the bottom. We drove back down to the little row of shops along the main road, went into the bar (open) to ask if they had croissants, and was told to buy them next door. Joy! After breakfast, we popped into the little Vival market to see what cheese they had, noted the prices, and then drove back all of 50m to the Maison de Fromage to see what their prices were. Seeing they were more than double, we hurried back to Vival and asked for some Saint-Nectaire fermier and lait, plus some Bleu d'Auvergne. I asked the girl serving what difference there was between Vival's cheese and the stuff up the road at double the price. None, she said. Up the road they cater for tourists and offer a service (of some sort), have more staff, and basically have a different business model. So be warned: if you are in St Nectaire and just want some cheese, get it from Vival. We popped back into the boulangerie to buy some bread au levain, and then set off towards Issoire and the autoroute. My DB wanted to see Issoire because it was where there was an attempted revival of the French motorcycle industry - Voxan - created in 1995. Voxan went into liquidation in 2009, but the name was bought by Venturi. Located in Monaco, Venturi's Voxan is making a come-back as an all-electric motorbike claimed as the most powerful on earth, packing in 200CV. I told my DB that Issoire is a bit of a dump, but he wanted to see it with his own eyes, and make a brief pilgrimage to this biker town. We drove through the centre where the halles (an historic covered market) was the only remarkable building, and out to the autoroute, and agreed that it was indeed a bit of a dump. We stopped for a bread and cheese (again) picnic lunch in the car at a packed service station. There were many families from the academy of Clermont-Ferrand in Zone A going south on holiday, no doubt in search of some sun! We found it on the other side of the Pas d'Escalette, the col which marks the separation of the causse du Larzac from the Languedoc plains. 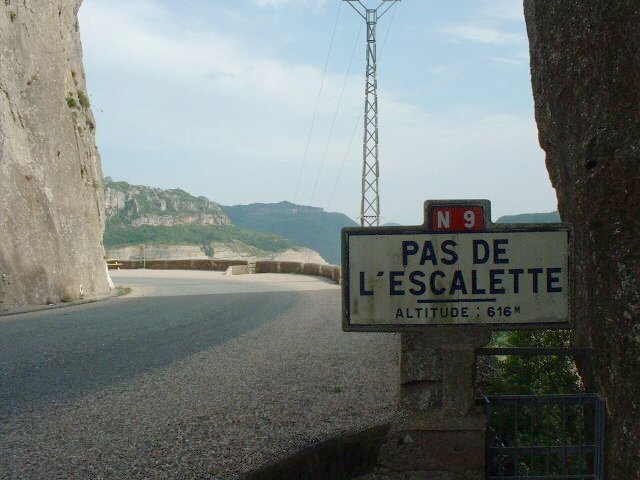 Before the autoroute was built, the N9 was the route south and the road crossed the Pas d'Escalette through a gap in the rocks which then took a sharp turn left. Suddenly the view opened out and you could see right down into the valley towards Lodève. Nowadays, you go through a tunnel but you still come out onto the amazing view, and invariably, better weather. The sun, the sun, how good it was to see the sun again! It was warm and bright and colourful. How I love living in the south! My little car was very pleased to have its engine stretched. It was a bit sluggish on the way up, but full of pep on the way back. At 25,000 km, it is now run in, and at its best. Hurrah! I remember coming down over the Causses in the 70s...and seeing the change of climate almost like driving through a portal. Indeed, France is not always sunny and pretty. Or delicious. We were happy to get back to the sunny south and warm up a bit! P.S. The link to your blog that comes to me via email is leading to a Technorati 'Page not found' error. Thought you'd like to know. EAUvergne? Eau dear! No, good headline! Sometimes going home is the only thing to do, especially when you know the sun will be shining there. Sorry your trip was such a wash-out. It's good to know when to stop, and not get further frustrated. We had another chance to take a break the following weekend. Come visit Kuwait. There's an endless supply of sun and warmth nearly year round. I will miss the warm weather, when we relocate back to Europe. Uncomfortable beds, overpriced cheese and being urged to go to a biker town. You really had a humdinger of a holiday, Sarah! We had a (now infamous) holiday in the South Hams in Devon where we came home 3 days as early because it poured with rain every single day and we all hated it. That was the last time we holidayed in the UK. I'd honestly rather stay in my back garden! What a shame yours was a bit grim too! I could do with a piece of saint Nectaire right now. I do miss French cheese. What is wrong with me? Oh, and it is sunny in London too for once! French cheese is good, nothing wrong with missing it! I preferred the Laguiole actually. It had a lovely bite. "The sun, the sun, how good it was to see the sun again! It was warm and bright and colourful. How I love living in the south!" Wow, that says it all doesn't and the views and the bread and cheese, the whole package, thanks for taking us along for the ride! Back in stagecoach days, the road across the Pas de l'Escalette was incomplete. Passengers would have to get out and meet another coach the other side of the pass. The "pas" were the steps carved into the rock face for the travellers to go up or down. At one time I was shown the actual steps, but later I went back and couldn't find them. In the Good Old Days we had terrific parties on a farm at St. Félix de l'Heras, the last village on the plateau. Friends owned a field which they leased to a shepherd for a price of one brébis (ewe) a year. Those ewes make the famous roquefort cheese. Fascinating, expat. Thanks for that glimpse into by-gone days. The parties sound fab. I love that view from the pas de l'Escalette, too. We had time to enjoy it last summer when our turbo broke and we drove to the next exit at 20 km/h.... St Necatire fermier is what the French term "une tuerie" - the industrial supermarket version tastes awful in comparison. I can't even tell you how much I miss Bleu d'Auvergne and Saint-Nectaire - my two favorite cheeses!